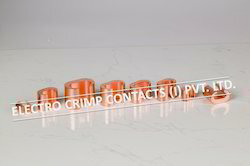 Pioneers in the industry, we offer Copper Components such as Copper 'C' Clamps, Copper Connectors, Copper Ring Tongue Terminals, Center Forged Copper Lugs, Copper Ring Tongue Solderless Terminals and U Cut Terminal Copper Ring Tongue from India. We are among the distinguished names in the industry, bringing forth Copper Connectors for our priceless customers. The offered connectors are made available in several specifications to suit the diverse requirements of the customers. 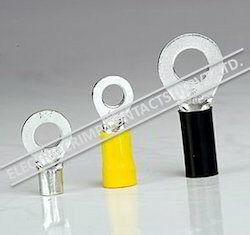 We procure high grade materials from established vendors for manufacturing these connectors. Offered components are competitively priced. 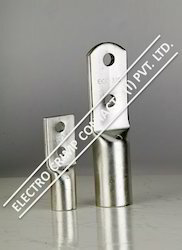 We are among the established manufacturers, suppliers and exporters of Copper ‘C’ Clamps in the industry. The offered clamps are made available in several specifications to fulfill the diverse requirements of the customers. Both standard and customized products are made available to the customers. 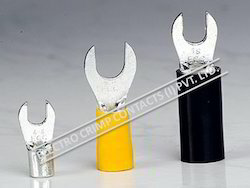 Owing to their flawless finish and corrosion resistance, these clamps are highly appreciated by the customers. We are among the eminent manufacturers, suppliers and exporters of Center Forged Copper Lugs in the industry. Characterized by precise designs and fine surface finish, these lugs are highly acknowledged by the customers. These lugs are highly resistant to corrosion and last for a very long time. Customers’ requirements are kept in mind while making these components available. We are among the leading manufacturers, suppliers, traders and exporters of Earthing Equipments in the industry. We are among the acclaimed names in the industry, bringing forth Copper Ring Tongue Terminals for our treasured customers. High grade copper and allied materials are sourced from established vendors for manufacturing these tongue terminals. These components are made available in several sizes and can be supplied in bulk quantities. Offered components are competitively priced. Since our foundation, we are known in the industry for offering a huge variety of Copper Ring Tongue Solderless Terminals. We believe in customer satisfaction so we use high grade processing techniques and equipments for our entire processing. We offer superior quality in our entire product range including Copper Ring Tongue Solderless Terminals at industry leading prices. Our entire products are widely appreciated among our clients due to their salient attributes. Looking for Copper Components ?